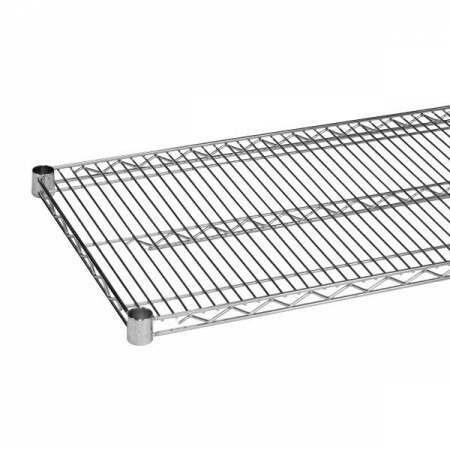 $29.99 Royal ROY S 2442 Z Polycoated Zinc Wire Shelf 24" x 42"
$60.99 Advance Tabco EG-2442 Green Epoxy Coated Wire Shelf 24" x 42"
$25.73 Winco VC-2442 Chrome Plated Wire Shelf 24" x 42"
$28.43 Winco VEX-2442 Epoxy Coated Wire Shelf 24" x 42"
Add plenty of storage space to your commercial kitchen by using the Thunder Group CMSV2442 Chrome Wire Shelving 24" x 42". The open wire design of this shelving piece helps keep dust from accumulating on the surface by allowing air to flow through the gaps. Thanks to its vertical ribs, this shelving piece ensures easy loading and unloading of food items while its plastic clips makes it easy to assemble. Made from chrome-plated metal, this NSF approved wire shelving is strong enough to hold heavy items without warping.